We’ve all heard the expression “listen to your gut” or “listen to your heart”… but this week I’ve learned the value of listening to my legs. Let me try to explain. The week of the breakup was probably the worst week of my life. It wasn’t the first time I’d had my heart broken and perhaps it won’t be the last… but this time it was truly profound. Everything I thought I knew about myself, about the human condition, and about love came crashing down in the most spectacular fashion. I knew deep down that I would come out of it and that I was better off in the long-run, but I couldn’t see it. I couldn’t feel it. I didn’t really believe it. I was desperate to find a way to tap into that inner strength again. Allowing myself to be French Stephanie for a while has certainly been a positive change and a source of inspiration for future plans. Studying here in France is exactly what I should be doing at the moment, of that I am sure! But of course that doesn’t mean that there haven’t been setbacks or hard moments. Yesterday morning, terrified of my first weekend really alone, I just didn’t want to get out of bed. I felt broken, I felt weak, and I felt incapable of passing the hours. I knew I needed to keep myself from falling down the rabbit hole, so I as much as I didn’t feel like it, I decided to head out for a run to see where my legs would take me. I didn’t think I would last long. I didn’t want to last long. I just wanted to crawl under a rock. French Stephanie had been out quite late the night before with a few of the other students in Villefranche and was feeling slightly tired and hungover. But then a funny thing happened…. the more I told myself that I wouldn’t be able to get through the run, and the more I doubted whether I could get through the day unscathed, the faster my legs moved beneath me. Something inside me clicked and started to rebel against my negative talk. It is almost as if my legs were in a battle with my heart, and my legs were winning. By a long shot. You think you’re broken? Hmph. I’ll show you a thing or two! 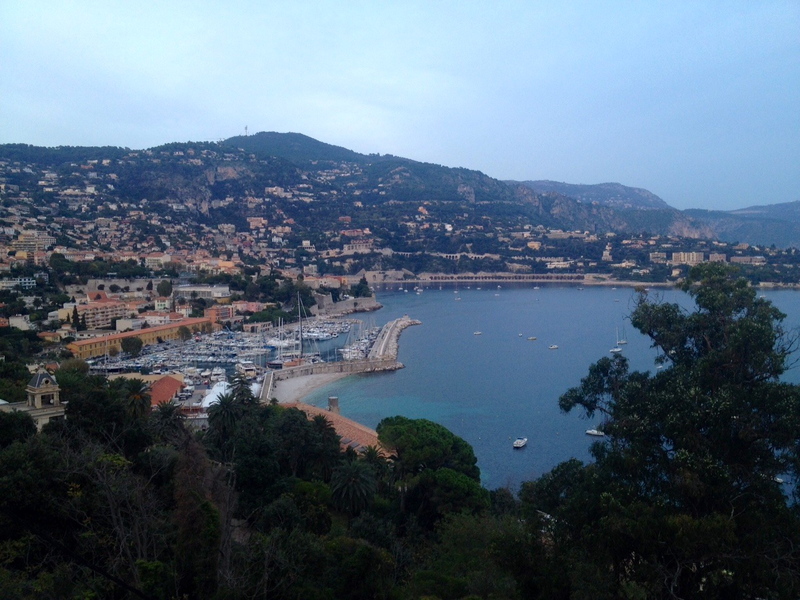 My legs pushed me up the hill, zigzagging through the quiet streets towards Villefranche-sur-Mer. I was sweating, but my breath was steady and my energy levels started to rise. My legs seemed to gain more strength and spring with each meter of altitude I climbed. I continued past the old church up a few more kilometers towards one of the highest points in the area, Mont Leuze, which sits at a modest 581 m. The path got steeper, but my legs just wouldn’t let up. I kept glancing at my watch in disbelief – can I really have run that fast uphill? – and continued along with a puzzled expression on my face. 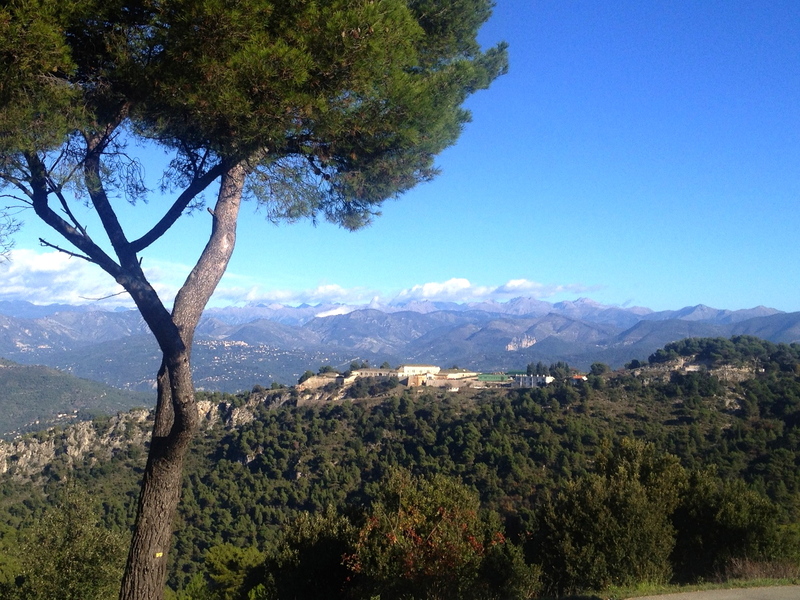 When I reached the Plateau de la Justice, I was rewarded with the most wonderful views of the valley behind Villefranche and the little mountain range in the distance. My legs went faster. It was almost as if elastic bands that had previously restricted my movement had suddenly snapped… I ran with complete abandon. I didn’t care if I tripped and fell flat on my face – it felt good to just let go and give my legs total control to take me where they wanted to go. It has been a long time since I felt that sense of liberty, strength, and lightness. Hell ya! I didn’t know where it came from, but my god, it did wonders. By the time I descended the hill back towards Nice, my puzzled expression was replaced with a little smile. I knew I’d be able to get through another day. And rock it. So what did I do this morning when I woke up with that same awful twisting feeling in my gut? I propelled myself back up the hill. I let my legs remind me that I was made of infinite strength. It had been there all along, just waiting to come out when I needed it. I’m so far from being broken – heck, maybe I’m even a bit stronger and lighter now on my own. Allez allez allez! In many situations when we get too into our own heads, it is often useful to try to listen to our guts or our hearts. But during a breakup, or perhaps any other major life setback, maybe there are times when we need to listen to our legs instead and give our other organs a break. If I had listened to my heart or my gut this weekend, I would have remained a puddle on the floor. Instead, I allowed my legs to do all the thinking and talking and I found that well of strength I’d been craving. I’ll leave you with one last tidbit: when you’re feeling down, when you’re celebrating, or maybe when you just want to celebrate being you, I can highly recommend the solo underwear dance party. Yes, I said it. This comes from a scene in a recent episode of Grey’s Anatomy, which really spoke to me. For those of you who haven’t seen it, this scene shows Callie trying to reclaiming her own right to be happy again after a relationship broke down due to a cheating partner… through the solo underwear dance party! I tried it, it works. ‘Nuff said. Have a great week everyone and keep the comments coming. I love them! I’ve got a busy week ahead with my second week of French (and I got myself bumped up a level, so lots to learn!). Whatever your week holds, I hope it is a good one… and I hope you work in a solo underwear dance party of your own. Hey Bruce! Great to hear from you. I’m so delighted that my blog posts can help, even if in some small way. Hang in there, you will get through this too! GOOD for you for getting out there today. Would be awesome to meet up for a run sometime – my parents are in Kingston, so not too far away! Thanks for commenting and thanks for following! I’m bringing my good underwear to Nice! Trail races, etc. I am in the Canadian military and returned from a 7 month deployment in Jan 2012. I have been battling PTSD like symptoms since my deployment and have not been doing much running. I did return to runing this past summer and ran the slowest 1/2 marathon of my life, but I did prove I could run again. In the process I trashed my knees pretty good. Doc and Physio said I have early arthritis and some miniscus issues. I would love to return to running, knees and all. Any words of advice? I would love to run a multi-day race next summer, like the Desert RATS fm Colorado to Moab. I got my heartbroken by a good friend and this weekend i celebrated my birthday and it didn’t matter about the phone calls i received, my heart focus on the one i didn’t get…hers! =( my feet have been in pain for about 6 months and they are healing very very slowly so i miss the feeling of what running can do to your soul…it heals at least temporary. thank you for writing this. I need to reclaim my right to be happy and enjoy my kids and my husband…. and do the underwear dance! Wow, those photos and your description remind me of a summer I spent in Antibes working on private boats. It is an absolutely fabulous part of the world. I did some hikes into the mountains on a few occasions, but was not brave enough to run up them, there certainly are some very steep ones!